The next Maia EAP brings you massive changes in Groovy, Grails, Griffon, Gant & Gradle support, mostly affecting framework configuration. Also, you can now write Groovy code and get full coding assistance with compilation as long as you have Groovy jars anywhere in a module classpath. Together with the new compiler Resource patterns path constraints feature (/ – path separator; /**/ – any number of directories) this made Groovy facet obsolete. So, there is no Groovy facet anymore. Everything you’ve just read about will be available in the next EAP. This entry was posted in New Features and tagged Gant, Gradle, Grails, Griffon, Groovy, Maia. Bookmark the permalink. The proposed changes to the gradle configuration look great! That is much better than requiring the gradle jar in the classpath. The screen shot didn’t show the gradle configuration screen, but it probably needs more than just an installation directory. It should also support a gradlew script. Many projects will just check in a gradlew into VCS to bootstrap their build process. It would be nice to allow selection of either a full gradle installation directory or a gradlew script. Probably there should be a possibility to run Gradle scripts via gradle-wrapper.jar. But in this case IDEA won’t resolve any Gradle’s classes except for those found in that jar. They’ll be red or even wrongly auto-imported (http://www.jetbrains.net/jira/browse/IDEADEV-40264). So IDEA will anyway need to undertstand where the full Gradle distribution is located. What if I don’t want the groovy class/script to be compiled? currently I’m having issues with this and Maia. Go to Compiler | Resource patterns settings and add a pattern there that covers your class/script path. 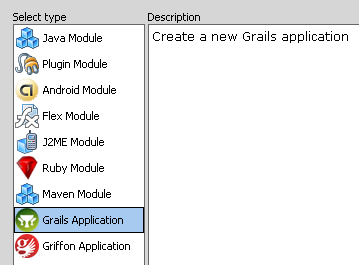 When i create a new application module the option to create a Grails application in not displayed. I’m using the home edition of idea IDE, does it matter?